The Best Bacon You've Ever Tasted or Your Money Back. Guaranteed. 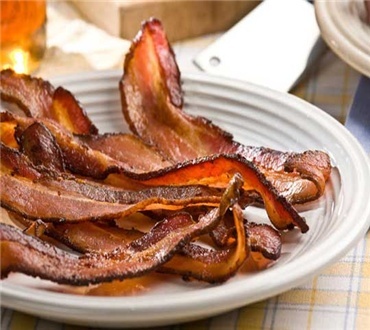 Lean, crisp and rich with natural meaty flavor, our bacon is thick-sliced, maple-cured and cob-smoked the way bacon was made long ago. Boston Globe made it a top pick from sources east of the Mississippi. The best you've ever tasted! All of our bacon comes in 1 lb. packages in either 2, 3 or 5 lb. quantities. Please make your selection from the drop down below. 1. Preheat grill to high (10 to 15 minutes, lid closed). When grill is hot, set topping ingredients next to grill. 2. Brush top of pizza crusts lightly with oil. Place oil-side-down on grill and cook until crusts begin to brown, about 3 minutes. Brush second side of crusts lightly with oil and flip. 3. Sprinkle cheese evenly over crusts. Top with apple slices and bacon. Close grill lid and cook until cheese is melted, 3 to 5 minutes longer. 4. Remove from grill to cutting board and let rest for about 3 minutes before cutting into wedges. What a great tasting bacon! Eating this bacon is like being back on the farm and getting a slab of bacon out of the smoke house. It's ahrd to find good bacon nowdays, but Dakin has nailed it. I've tried them all and Dakin wins. Best Bacon I have ever eaten and I'm from the south! Great Flavor. Doesn't Shrink when cooked, Smoke does not overpower meat. Nicely sliced.